YOU ARE HEREBY ADVISED that submitting our "free help" form or any information through Workers-Compensation-Law.us does not form an attorney client relationship. Disclaimer: The information provided on this web site is not legal advice. Information provided by Workers-Compensation-Law.us conveys general knowledge related to legal issues commonly encountered when dealing with the workers' compensation insurance and benefits. Use of the Workers-Compensation-Law.us website and any information contained therein is subject to additional terms and conditions. Site Sponsored by: Workers-Compensation-Law.us and supporting advertising attorneys. Thank you for visiting Workers-Compensation-Law.us. The purpose of Workers-Compensation-Law.us is to give the visitor a general understanding of workers' compensation policies and procedures as well as the regulations and laws involved with workers' compensation on an overview basis. Information obtained through Workers-Compensation-Law.us is not to be construed or interpreted as legal advice. General information, statements, principles and conclusions presented at Workers-Compensation-Law.us may not reflect specific regulations or determinations of local, state and federal jurisdictions. Workers' compensation laws are frequently revised and vary from jurisdiction to jurisdiction, and due to the varying interpretations of these local, state, and federal laws, users of Workers-Compensation-Law.us are urged to consult professional legal counsel in his or her state regarding the applicability information obtained at Workers-Compensation-Law.us to any specific problem. The determination of whether a user needs legal services and a user's choice of a lawyer should not be based on websites or advertisements. Workers-Compensation-Law.us should not be used as a substitute for legal counsel. Any information regarding our attorney and advocate sponsors has been provided by the sponsors and has not been verified by Workers-Compensation-Law.us. Workers-Compensation-Law.us does not warrant the validity of the information, nor does it guarantee the quality of the work product. The determination of the need for legal services and the choice of a lawyer are extremely important decisions and should not be based solely upon advertisements or self-proclaimed expertise. Workers-Compensation-Law.us does not offer legal advice, recommendations, mediation or counseling under any circumstance. Workers-Compensation-Law.us is designed to assist users in understanding workers' compensation and to assist users in contacting reputable experienced counsel based on the user's specified needs. The user of Workers-Compensation-Law.us assumes all responsibility for said user's actions, selection of legal counsel, and use of information obtained on Workers-Compensation-Law.us. As between Workers-Compensation-Law.us and the user of Workers-Compensation-Law.us: all right, title and interest (including all copyrights, trademarks and other intellectual property rights) within Workers-Compensation-Law.us belongs to Workers-Compensation-Law.us. In addition, the names, images, pictures, logos and icons identifying Workers-Compensation-Law.us's products and services are proprietary marks of Workers-Compensation-Law.us and/or its subsidiaries or affiliates. Except as expressly provided below, nothing contained within Workers-Compensation-Law.us shall be construed as conferring any license or right, by implication, estoppel or otherwise, under copyright or other intellectual property rights. The user of Workers-Compensation-Law.us is hereby granted a nonexclusive, nontransferable, limited license to view and use information retrieved from Workers-Compensation-Law.us provided solely for the user's personal, informational, non-commercial purposes, and provided the user does not remove or obscure the copyright notice or other notices. Except as expressly provided above, no part of Workers-Compensation-Law.us, including but not limited to materials retrieved there from and the underlying code, may be reproduced, republished, copied, transmitted, or distributed in any form or by any means. In no event shall materials from Workers-Compensation-Law.us be stored in any information storage and retrieval system without prior written permission from Workers-Compensation-Law.us. Use, duplication, or disclosure by or for the United States Government is subject to the restrictions set forth in DFARS 252.227-7013(c)1)(ii) and FAR 52.227-19. Materials available in the Workers-Compensation-Law.us website are protected by copyright law. 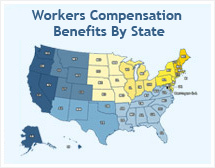 Copyright © 2012 Workers-Compensation-Law.us. All rights reserved. Workers-Compensation-Law.us does not review or warrant the contents of any links to Workers-Compensation-Law.us. Workers-Compensation-Law.us is not responsible for any material or information contained in the linked sites or provided by sponsors. Users of Workers-Compensation-Law.us may provide links to Workers-Compensation-Law.us, provided (a) the user does not remove or obscure, by framing or otherwise, advertisements, the copyright notice, or other notices on Workers-Compensation-Law.us, (b) the user provides Workers-Compensation-Law.us with notice of such a link by sending an e-mail to info@newclient.us, and (c) the user discontinues providing links to Workers-Compensation-Law.us if notified by Workers-Compensation-Law.us to do so. Workers-Compensation-Law.us IS PROVIDED ON AN "AS IS," "AS AVAILABLE" BASIS AND Workers-Compensation-Law.us EXPRESSLY DISCLAIMS ALL WARRANTIES, INCLUDING THE WARRANTIES OF MERCHANTABILITY, FITNESS FOR A PARTICULAR PURPOSE, AND NONINFRINGEMENT. Workers-Compensation-Law.us DISCLAIMS ALL RESPONSIBILITY FOR ANY LOSS, INJURY, CLAIM, LIABILITY, OR DAMAGE OF ANY KIND RESULTING FROM, ARISING OUT OF OR ANY WAY RELATED TO (A) ANY ERRORS IN OR OMISSIONS FROM Workers-Compensation-Law.us AND ITS CONTENT, INCLUDING BUT NOT LIMITED TO TECHNICAL INACCURACIES AND TYPOGRAPHICAL ERRORS, (B) ANY THIRD PARTY WEBSITES OR CONTENT THEREIN DIRECTLY OR INDIRECTLY ACCESSED THROUGH LINKS IN Workers-Compensation-Law.us, INCLUDING BUT NOT LIMITED TO ANY ERRORS IN OR OMISSIONS THEREFROM, (C) THE UNAVAILABILITY OF Workers-Compensation-Law.us OR ANY PORTION THEREOF, (D) THE USER'S USE OF Workers-Compensation-Law.us, OR (E) THE USER'S USE OF ANY EQUIPMENT OR SOFTWARE IN CONNECTION WITH Workers-Compensation-Law.us. A COVERED PARTY (AS DEFINED BELOW) SHALL NOT BE LIABLE FOR ANY DIRECT, INDIRECT, INCIDENTAL, SPECIAL, OR CONSEQUENTIAL DAMAGES OF ANY KIND WHATSOEVER (INCLUDING, WITHOUT LIMITATION, ATTORNEYS' FEES AND LOST PROFITS OR SAVINGS) IN ANY WAY DUE TO, RESULTING FROM, OR ARISING IN CONNECTION WITH Workers-Compensation-Law.us, INCLUDING ITS CONTENT, REGARDLESS OF ANY NEGLIGENCE OF ANY COVERED PARTY. "COVERED PARTY" MEANS Workers-Compensation-Law.us, ITS AFFILIATES, ITS LISTEES, AND ANY OFFICER, DIRECTOR, EMPLOYEE, SUBCONTRACTOR, AGENT, SUCCESSOR, OR ASSIGN OF Workers-Compensation-Law.us, ITS AFFILIATES, AND ITS LISTEES. These Terms and Conditions shall be governed by and construed in accordance with the laws of the State of New York, USA, as they apply to agreements made and solely performed therein. Disputes arising hereunder shall be exclusively subject to the jurisdiction of the state and federal courts of the United States of America and/or the state courts of New York and jurisdiction therefore shall rest solely in New York, USA. Workers-Compensation-Law.us and these Terms and Conditions may be changed by Workers-Compensation-Law.us with or without notice. Please review this link on a regular basis for changes. Continued use of Workers-Compensation-Law.us following any change constitutes a user's acceptance of the change. These Terms and Conditions incorporate by reference any notices contained on Workers-Compensation-Law.us and constitute the entire agreement with respect to user access to and use of Workers-Compensation-Law.us. If any provision of these Terms and Conditions is unlawful, void or unenforceable, then that provision shall be deemed severable from the remaining provisions and shall not affect their validity and enforceability. IF YOU DO NOT AGREE IF THESE TERMS AND CONDITIONS, OR THEY ARE NOT ACCEPTABLE IN FULL, YOU MUST IMMEDIATELY TERMINATE YOUR USE OF Workers-Compensation-Law.us. GENERAL DISCLAIMER: THIS SITE IS AN ADVERTISEMENT FOR ATTORNEYS AND NOT AN ATTORNEY REFERRAL SERVICE.